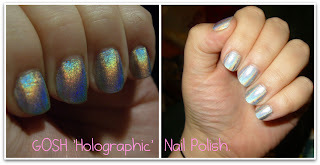 Sophsterlicious • UK Blog: Holographic Nails - Take Two! How stunning is that nail polish? I know, right :) It's GOSH's Holographic, again. I posted a NOTD and update on this ages ago, and have never really worn it since. I absolutely LOVE how it looks, but for some reason it never lasts on me, and it takes me 3/4 coats to get it looking smooth and non patchy. To me this polish takes a lot of effort, but the results are stunning! Apparently I'm wrong, a few girls on twitter have said a good topcoat keeps it in place for them, So I must start applying some.. (I know, I should always use a topcoat, but I forget!) and I'm gonna try applying thicker coats so I don't need so many. Any tips for me when using this? It looks lovely, doesn't it? Shame it only lasted two days before chipping!.. I so want this nail polish, it looks really good on your nails. Like the above comment, I would suggest using the topcoat on the inside of your nails as well as the tips, it really does make the difference. Whoa, I could've sworn this was a Nfu Oh polish from the photos! Well I have read that it does this on any one and you shouldn't use a top coat with a holo polish as it ruins the effect!! When I wear this I just don't have much hope for it, as gorgeous as it is.